My kaka (uncle) loves potatoes, be it in the form of shaak, baked, fried, or as aloo parathas or bateta vada. As long as potatoes are the main ingredient. I don’t blame him. Potato is such a versatile vegetable that many dishes can be created from it. I know most of you know how to make aloo parathas or potato stuffed parathas. However, have you ever noticed how you either get left with some stuffing or the dough? After so many years of cooking experience, I still get left with a tablespoon or so of either. It sits in the fridge till one day it says hello to the dustbin. Not any more because I actually measured out all the ingredients the last time I made the parathas.My aloo parathas cannot beat the ones we had on a cold crispy early morning on our way to Vrindavan a few years ago. Hot extra sweet tea, dahi, and aloo paratha dripping in ghee. Yummy! After the experience of gorging on the most delicious aloo parathas on our way to Vrindavan, I thought I’ll never get to have parathas like those unless of course I travel Vrindavan by car from Delhi. However, a few days ago my daughter and I went to Kapoor Cafe,in HSR Layout, Bangalore. The aloo parathas we had were so delicious. These ones were not dripping wth ghee but with large blobs of butter. We had one each, and then for the rest of the day we couldn’t move from the sofa as the paratha took its own sweet time to digest. The only thing I didn’t like about dining at Kapoor Cafe was that you had to order yogurt separately! Who doesn’t serve yogurt with stuffed parathas? However, that should not deter you from visiting the cafe if you’re ever in Bangalore. I find adding freshly chopped fenugreek(methi) makes the parathas taste so different. 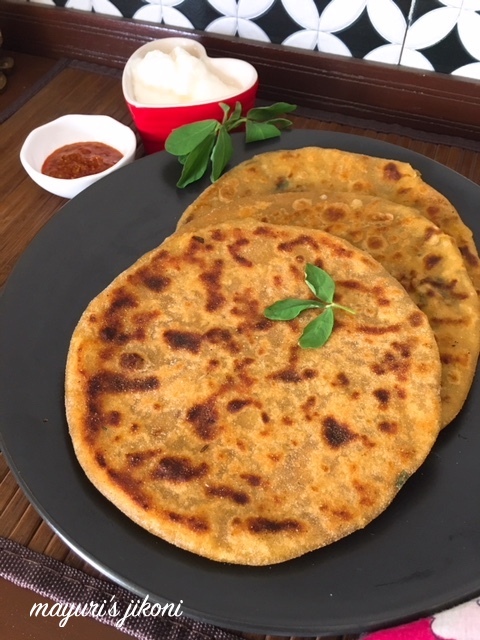 A family friend of ours would add ajwain (ajmo, carom seeds) and I found that it would make the parathas taste different. A fellow food blogger Mina (Give Me Some Spice), suggested that any left over filling can be used up to make quick aloo parathas. Add the filling to your normal atta and make the dough. I’ve made her style parathas often and they turn out really good. Check the recipe here. Add oil, salt and turmeric powder to the flour. Mix well. Add the water and knead into a soft dough. To the mashed potatoes add all the ingredients of the stuffing and mix well. For tempering, heat oil in a small pan. When it is hot add the mustard, cumin, sesame and carom seeds. Add the asafoetida and immediately add the chopped onion. Saute the onions till they become soft. Pour it over the stuffing. Mix the stuffing well. Divide the stuffing into 8 parts and make balls. Roll each piece into a ball. If the dough is sticky, oil your palms. Using your thumbs and fingers, make a cup shape out of the dough piece. Place one ball of the stuffing in it. Cover up with the dough and press the edges together in the middle. Roll into a bit of flour and roll out the stuffed dough into a paratha, gently. Place the paratha on the hot tawa and let it cook on both sides. Smear oil on one side and cook till brown specks appear. Flip the paratha and repeat the procedure. Repeat steps 5 to 8 with the remaining dough and stuffing. Serve hot with a blob of butter or ghee, pickle and yogurt. Can make ahead. Just cook the parathas on both sides without the oil. Just before serving, smear with oil and cook both sides. Nami usually makes them using potatoes as well as paneer. You can use 1 cup mashed potatoes and ½ cup grated paneer. Use the nice powdery potatoes and not the sticky ones. In Kenya, the best potatoes for this recipe are the Meru potatoes. When using potatoes in India, soak them in water for an hour or so before boiling them. This will make them a bit flaky and not sticky. Leaving the kneaded dough for at least an hour makes it more gluteny and easier to roll. work with for any kind of stuffed parathas. Just cant take my eyes from this ultimate aloo parathas, makes me hungry already. Oh my aloo paratha, who would say no? I know someone, my daughter 🙂 I always add ajwain in the paratha dough.It helps in digestion.